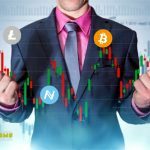 The cryptocurrency market is still subject to the influence of short-term “spikes” of interest, which affect volatility. Apparently, the market finds support in the area of ​​lows, and this does not allow it to continue to decline. At the same time, the highs area does not allow quotes to go up, which may indicate stabilization of the situation in the medium term. ETH/USD continues to move in the medium-term downlink. After the breakdown of the support of the previous channel, the market tested this line as resistance. The short-term situation is characterized by a corrective uptrend. The current testing of the support line has a chance both to rebound from it and to break it. In the event of a rebound, quotes may retest the main resistance at $ 237.40. 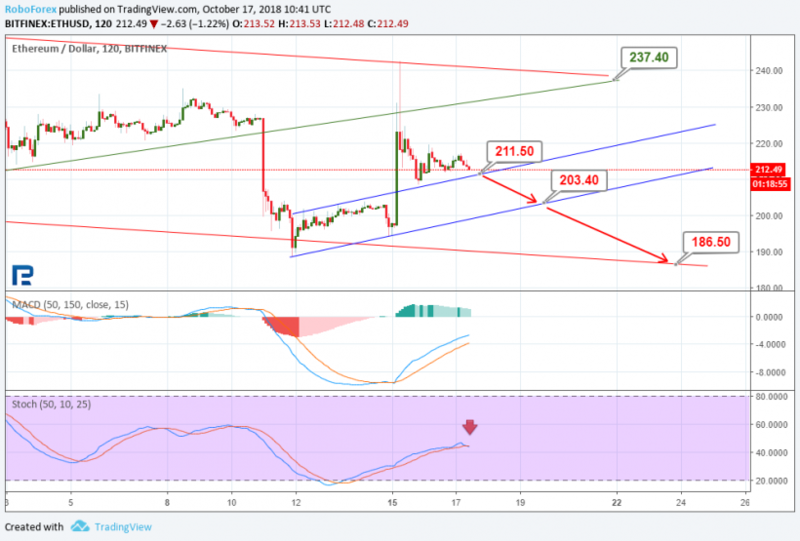 The breakdown of the support level at $ 211.50 will be a signal of the development of a downward impulse to short-term support at $ 203.40. A breakdown of this level, in turn, will allow quotes to reach the support line of the main channel around $ 186.50. The formation of the “Black Cross” on the Stochastic indicator is in favor of the hypothesis of a future decline. 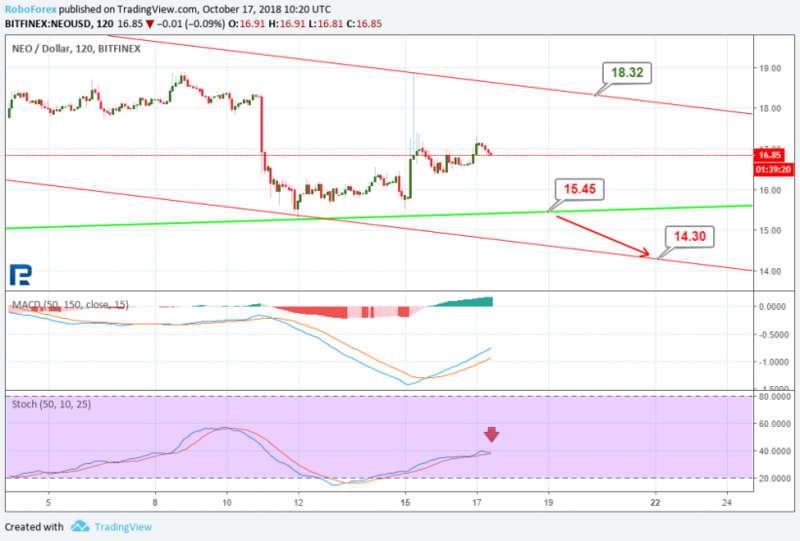 XRP/USD demonstrates a rebound from the medium-term support and, at the same time, the end of the downtrend. Testing the resistance line at the $ 0.5051 mark may end with its breakdown, and it will open the way for quotes to the upper projection channel - to the level of $ 0.6134. The development of such a growth scenario is the “Golden Cross” on MACD and the directionality of the Stochastic lines. 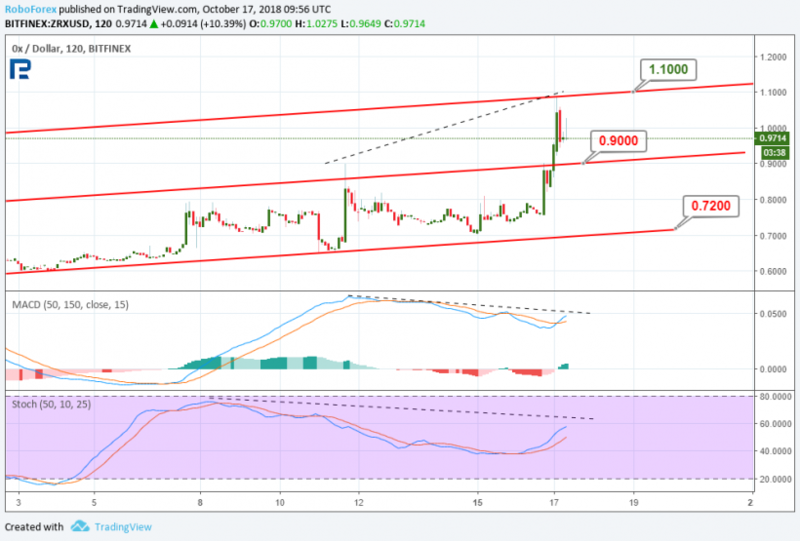 It is possible that XRP/USD rebound from the resistance with a subsequent decrease to the current support level - $ 0.4100. Its breakdown will mean the continuation of the development of the downward trend to the target support level at $ 0.3094. 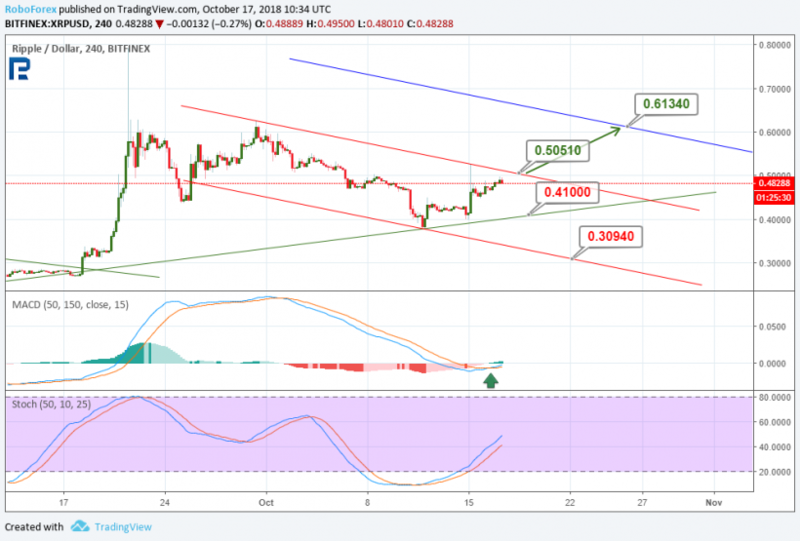 NEO/USD demonstrates the development of a correctional growth phase within a medium-term downward trend. The possible goal of short-term growth is the line of resistance of the main corridor - the level of $ 18.32. The potential for continued growth is also indicated by the directionality of the MACD lines. If we look at the prospects for further decline, we will see that it is hampered by the support line at $ 15.45. At the same time, on the Stochastic indicator, there are prerequisites for the formation of the “Black Cross”. But the signal for the continuation of the downward trend will be precisely the breakdown of the level of $ 15.45. The purpose of the decline in this case will be the level of $ 14.30. 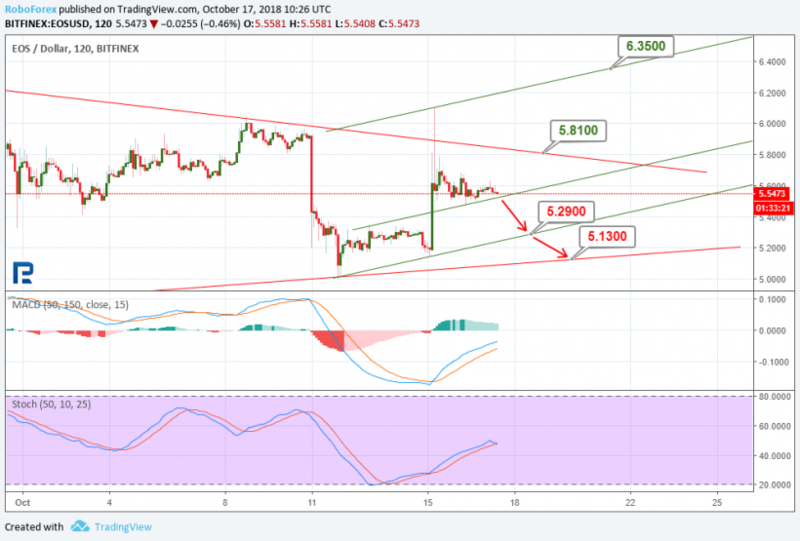 From a technical analysis point of view, the current EOS dynamics on the 2-hour timeframe demonstrates the continuation of the medium-term consolidation, while the short-term trend is upward. The last growth impulse tested the resistance line of the consolidation channel. The breakdown of resistance in the area of ​​$ 5.81 will allow quotes to develop the channel of the upward movement to the level of $ 6.35. The currently observed testing of the local support line may result in its breakdown and decrease to the level of $ 5.29. As a confirmation factor, it is worth waiting for the formation of the “Black Cross” on the Stochastic indicator. In the longer term, a decrease in quotations will allow testing the support of the consolidation channel in the region of $ 5.13. In the short term, we can expect a decline to support at $ 0.90. A rebound 0x from it will allow you to rise to the resistance line - the level of $ 1.10. At the same time, on the MACD and Stochastic indicators, the formation of divergence is observed. This gives grounds to expect a breakdown of the support level of $ 0.90, which will allow quotes to decline to the level of medium-term support - $ 0.72. © 2018 bit.news | queries 214, for 0.438 sec.